maxon Brushless RE 50 Motor - maxon precision motors, inc.
RE 50's "heart" is an ironless rotor, which results in detent-free running and minimized mass inertia. The combination of a two-pole Neodymium permanent magnet with the patented winding technology results in high torque and remarkable acceleration. The drive measures Ø50 x 108mm and is available with four different windings. 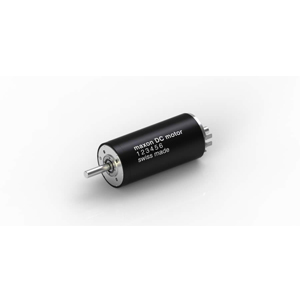 It reaches a nominal torque of up to 0.38 Nm, a nominal speed of 2800 to 5700 rpm and an efficiency of more than 90%. Low nominal voltage and high power density make the RE 50 an excellent choice for the use in battery-powered applications.